The State Governor of Connecticut has approved the first stage of a $1 billion data center project powered by fuel cells, to be built on a former Stanley Black & Decker factory in New Britain, Hartford County. Governor Dannel P Malloy promised the site would bring up to 3,000 jobs and $45 million in tax revenue over 20 years, at a press conference held to announce the decision. 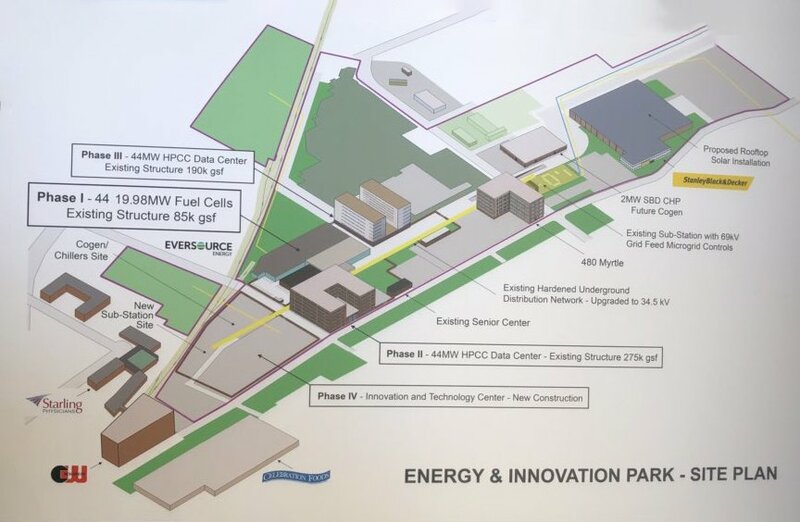 The State Department of Energy and Environmental Protection has approved the first phase of a proposed energy and innovation park, which will use fuel cells in a micro-grid to lower emissions, according to reports in the Connecticut Mirror. The project would be the biggest indoor micro-grid in the world, according to reports. Energy Innovation Park, LLC (EIP) plans to build a 20MW grid in a 45,000 square foot factory formerly occupied by Stanley Black & Decker on Myrtle Street, New Britain. The micro-grid will reuse the building’s electricity and gas infrastructure to reduce costs, according to Mark Wick of EIP, and be powered by 44 trailer-sized fuel cells from Doosan Fuel Cell in nearby South Windsor. “We’re providing 20 megawatts of power on only about 45,000 square feet of space,” Wick told the New Britain Herald. This could make it the world’s largest indoor fuel cell installation. The grid is the first phase of a project which could ultimately total $1 billion in investment and provide up to 3,000 direct and indirect jobs. Phase II will convert that building into a data center, as per EIP’s diagram (right) shown at the launch. The potential tax revenues include $8 million from the fuel cell project alone, the event was told. The project will be overseen by Centrica Business Solutions and Direct Energy Business; construction is due to begin in early 2019.